Our power came back a short while ago, so that means my web server is back up again! And THAT means angelahighland.com is once more reachable. And I said this over on the post I put up on angelahighland.info, but for those of you who didn’t see me post it there, or see my last post on Dreamwidth: the Rebels of Adalonia books are currently ON SALE for 99 cents each right now! Since sale prices on the Rebels books are outside my control, I will NOT know when this price stops being active. So if you don’t already have these ebooks of mine, now is a real good time to get them. Or tell a friend if you know somebody who you think might like my writing! Please do spread the word, I need all the word of mouth I can get. Particularly since right now I don’t have a day job. Thank you in advance! The Rebels books are available on all major ebook platforms, as well as directly from Harlequin, Carina Press’s parent company. 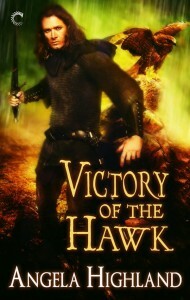 All the links to buy the books are on the official Valor of the Healer, Vengeance of the Hunter, and Victory of the Hawk pages. And do remember: the Rebels books are NOT standalone novels. You DO need to read all three of them for the complete story. But at 99 cents a pop, that’s still cheaper than most paperbacks! Every new January for me means the coming of my birthday! This year, since I got a nice yearly bonus from the day job, I treated myself to a birthday present: a new iPad Pro. 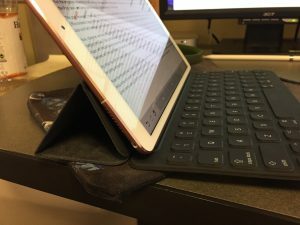 Today on Here Be Magic, the group blog I participate in, I’ve got a post up about what it’s like to use this device to write on. Here on my own site, I’d like to expand on that somewhat and talk about what I like about this device so far, and why I decided to get it. Long post is long! The rest is behind the cut. Testing, testing, testing, are we back on? Looks like JournalPress, the WordPress plugin Dara and I have been using to crosspost to Dreamwidth, has finally updated itself. The dev fixed the crossposting problem from the plugin’s end, and included a patch Dara had posted about on the plugin’s forum over a year ago. Awesome! So let’s see if I can actually crosspost to Dreamwidth again! Editing to add: Oh YAY it actually worked! For those of you who may have missed it, here’s the last post I did over on angelahighland.com: my writing plan for 2018. 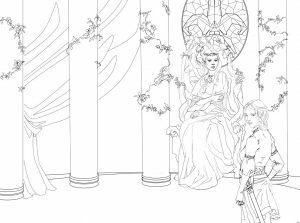 There’s a rough of the cover art for the forthcoming Walk the Wards, featuring Amelialoren and Melisanda of the Seelie Court! The holidays are done and I’ve had a nice long vacation, so it’s time to set a 2018 writing plan! Which is surprisingly organized of me, I feel. But it’s a level of organization I really need to aim for, if I want to get my writing back in gear this year. So let’s see if I can pull this off. The goal here is to see if I can finally have the novellas that make up Walk the Wards ready to release by Norwescon. That convention falls in mid-April this year. What this will require: getting the writing done by mid-February or so. Then beta reading has to happen, as well as a proper edit pass. I’ve already initiated a cover art discussion with the same artist I engaged to do the cover for Warder Soul, Nicole Cardiff. She sent me a thumbnail sketch that I like, and we’ll be moving forward with turning that into an actual picture. This’ll be from the story “The Light Beyond the Gate”–the story of what happens to Jude while she’s in Faerie during Bone Walker. Who’ll be in this picture? 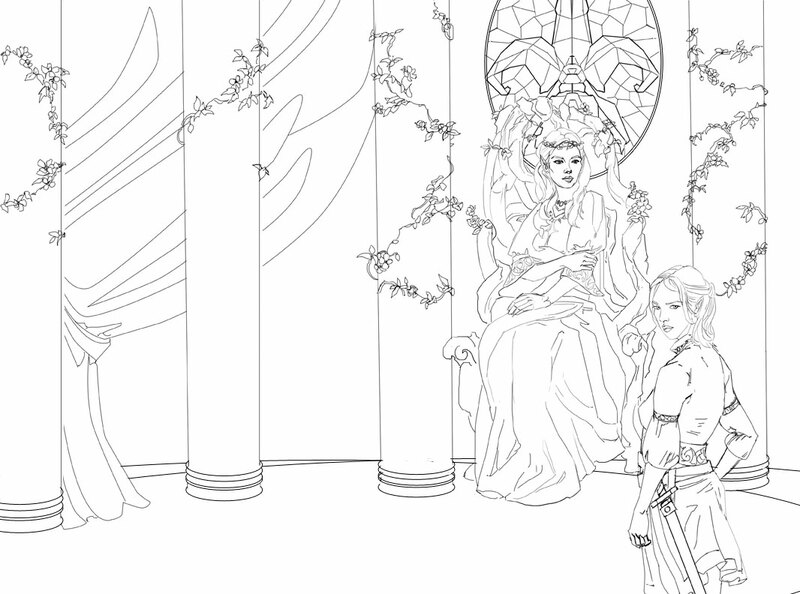 No less august a personage than Amelialoren, the Queen of Light and Morning, monarch of the Seelie Court in her throne room. And there will also be Melisanda ana’Sharran, warrior of the Seelie Court. So you’ll get two important Seelie women on the cover for the price of one! And a general status check: “A Power in the Blood” and “Diminuendo” are both done in first draft form. I’m working now on “The Deepest Breath of Song”, Oscar’s story, though I will probably swap back and forth between it and the other two tales as I proceed to finish this thing up. As of last night, the book was just shy of 55,000 words and “The Deepest Breath of Song” crossed the 10K mark. I suspect this book as a whole will be a bit shorter than Faerie Blood or Bone Walker, but I’m okay with that. Once Walk the Wards is safely out the door, I need to return to Queen of Ghosts, my Hades and Persephone story. What has to happen here: review of edits already done, and applying of those to the manuscript. Then I’ll need cover art for this, too. Once Nicole has finished the cover art for Walk the Wards I will probably also get her to do this book as well. Target for when to get this done: some time this summer, but what’s more likely is maybe to have this done in time for Orycon. Which would be nice, because then I could have a new release at Norwescon, and a new release at Orycon as well. Probably in parallel to the two above things, I’ll return to working on Warder Soul, Book 3 of the Free Court series. This doesn’t necessarily have to wait till Walk the Wards is released. But it does have to wait at least until I have finished, solid versions of “The Plight of the Warder’s Daughter” and “The Light Beyond the Gate”, because both of these are important setup for that book. I do not yet anticipate this book being ready to release this year. But I will be trying to get it ready before next year’s Norwescon. Since I’m liking the idea of targeting release dates for conventions where I’m likely to show up and be able to sell books, this might mean having it ready by a convention in January 2019. More as I know it. I have a lot I want to write up about my trip to Quebec, and in particular about both Camp Violon Trad and Memoire et Racines. This post, though, is about news I received while Dara, Vicka, and I were going to Memoire et Racines: i.e., that my friend Susan Moseley had passed away. Some many months ago Susan had told me in email that she’d been diagnosed with a stage 4 brain cancer. That deeply alarmed me at the time, because yeah, I know from experience with brain cancer; it’s what killed my mother. For a while Susan hung in there, emailing me periodically and letting me know how she was doing. But I’d not heard from her much this year at all, and had not received any reply to the last couple of times I’d emailed her to let her know I was thinking of her. So I’d started to worry about whether her health had taken a turn for the worse. I gave Clare my deepest condolences, and, since I can’t go to the memorial the family is having for her, I wanted to write up this post about Susan and what she meant to me, a longer version of what I posted to Facebook. I first met Susan online via the Le Vent du Nord Facebook page, when I first announced myself as a new fan of the group, and inviting other fans to come and chat with me. Susan emailed me and we hit it off pretty splendidly. She was responsible not only for my eventual decision to try to go to my first Le Vent du Nord show–but also for that show turning out to be the one back in 2012 that took place right before Dara and I got double-married in Canada with our friends Elane and Bai. She even arranged to get us a bottle of champagne. It was awesome. She was also a significant supporter of the 2012 Kickstarter I ran for the second edition of Faerie Blood along with the release of Bone Walker. And by supporter, I mean not only monetarily, but also contributing significant beta reading effort for Bone Walker. We’re talking old school proofreading, too. She printed off the entire manuscript and wrote her remarks up on it. And then mailed it to me. I was super impressed by this, though she modestly demurred about having done anything special. Dara and I got to meet her in person only once, during the 2012 Great Atlantic Canada Adventure. But we did spend a lovely afternoon with her wandering around Toronto. And, as I recall, she was wearing a Doctor Who shirt. She sent me print copies of her daughter’s wonderful Ensign Sue Must Die comics, all three parts thereof. She sent me a double album of music by the Stringband, by way of furthering my familiarity with Canadian folk music. She sent me a couple of adorable little fingerpuppets made in the likeness of Elvis (an obvious choice for me, of course) and Virginia Woolf (NOT an obvious choice for me). They are now living on our refrigerator, since they have magnets on them. She sent me tickets for Dara and me to get into the Le Vent show at Hermann’s jazz club in Victoria, which has since gone down in my personal fangirl history as “the first show where I had the mammoth”. And oh, her love for Le Vent du Nord. My own affection for this band got a lot of its initial fuel from her, just because she spoke so highly of these boys not only as musicians, but also as people. She arranged multiple gigs for them in Uxbridge. She gave them meals and crash space and in general, from what she told me, was an excellent den mother type making it easy for them to go make awesome noises at all her neighbors. It was very, very obvious to me from her emails how much she loved them, and now, every time I see them play, I will think of her. And I’ll hope that a little bit of her soul will waft along with every note they hit. Rest in peace, dear Susan. I’ll miss you. Dara has been on a big kick with the turn of the year to get rid of a lot of things we don’t need anymore, and this has rolled over onto me a bit to make the first week of 2017 one of solving a bunch of small problems. Problem #1: Backups weren’t working correctly on our servers. How this was solved: Discovering that rdiff-backup wasn’t going to create a directory for me in the backup location if that directory didn’t already exist, unless I gave it a –create-full-path argument. Also discovering that scripts in cron.daily, cron.weekly, and cron.monthly should not actually be in cron format, unlike anything you put in cron.d. Once I figured out both of these things, I was finally able to get backups working properly. Problem #2: My older laptop got unacceptably warm after a few minutes of use, particularly when booted into Windows 10. 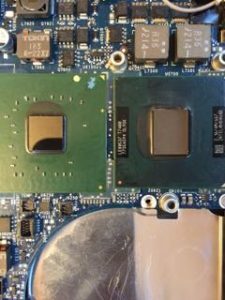 How this was solved: Taking Winnowill apart, which let Dara not only give the inside a good cleaning, but ALSO let her discover that the goop that’s normally supposed to provide some insulation conductivity between the CPUs and the heat sink had dried out. A lot of it had in fact crumbled away. So she ordered some new goop and put new layers of that on the CPUs, and then we put the machine back together. This made the machine much happier when booting into Windows 10 and actually trying to do things in that OS. Meanwhile we’re also updating the hard drive from its current 500GB one to a 1T, and going from a Western Digital Blue to a Western Digital Black. Which, Dara tells me, should mean an increase in hard drive performance and hopefully another reduction in the likelihood of it overheating. In general this should also hopefully increase the lifespan of this machine. Given that I got it way back in 2007, and this box is still chugging along, that’s still a pretty impressive lifespan for a laptop. I was thinking of selling it, but Dara says she’d like to keep the box around just for the sake of having an older and still functional Mac. Eventually it might become our new Time Machine server if Elda gives up the ghost. All of this did at least also give me a chance to take a picture of what the inside of Winnowill looks like! Problem #3: The cushion on the left ear of my Bluetooth headphones split a seam. Apparently this is a thing with Jabra move headphones? A couple weeks ago I noticed that there was a split seam on this ear cushion, and when I googled for it, I found quite a few other users complaining about the same thing. This has happened often enough that Jabra sells replacement cushions, and the replacements are supposedly sewn and not glued. I ordered a pair of the replacements and got the new one for the left ear on there okay with Dara’s help. Keeping the cushion for the right side in reserve on the assumption that this will eventually happen on that side, too. There are other things I’m in the middle of doing that are more domestic–replacing old bras and old jeans–and Dara and I will also be looking into replacing our mattress. But the techie problems are more interesting, so the post is about those! Any problems y’all have solved so far with the new year? Editing to add: By “goop” on the CPU I actually meant, of course, conductivity rather than insulation. Oops! Many thanks to alinsa for pointing that out.